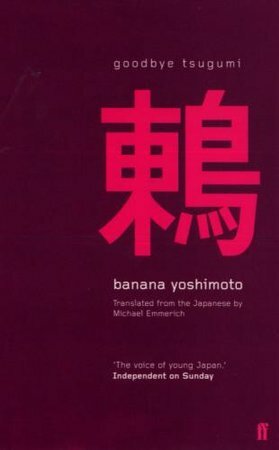 I bought this book in a library sale on the vague memory that I'd read and enjoyed some other book by Banana Yoshimoto. I don't, in fact, remember anything about that book apart from the author. But that's OK. I started on a new page with Goodbye Tsugumi. And I loved it in a very subtle way. Goodbye Tsugumi is about two cousins, Maria and Tsugumi. They live on the seaside in an old inn. Maria's mother in the mistress of a married man and lives apart from him. Tsugumi has been an invalid her entire life and while she can be quite charming at times, she is also spoilt and mean. Maria seems to be the only person who understands Tsugumi and they become close growing up. Maria spends one final summer at the inn where she must say goodbye to her childhood and to Tsugumi before leaving for university where her family is finally reunited. I find it amazing how much Yoshimoto was able to fit into this little novel. My hat goes off to her, as this book is about so many things. Growing up, growing apart, first love, families... even a bit of revenge. I felt like Maria's voice throughout the book was really insightful and lovely. Despite everything else going on around her, Maria was able to show us that we must be thankful for little things all around us. The ocean, an old mailbox, nothing should be overlooked or taken for granted. I thought Tsugumi was a wonderful, complex character. From the first page, I couldn't really stand her and I was worried that I'd find it difficult to read a book with such a rotten person for a main character, but from about midway into the book, my thoughts had changed completely. And there at the end I was completely behind Tsugumi, rooting for her as she wreaked her own sort of justice. I really enjoyed this one. There's not a lot to the plot, but it's a very sweet little story. Sounds interesting - especially the character of Tsugumi. I really should read some Banana Yoshimoto - I've been hearing about her a fair amount lately. Wasn't it a beautiful little book? I really need to get my hands on Kitchen. The more I read Yoshimoto, the more I like her.